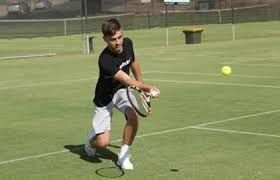 How Often Should a Junior Tennis Player Train? All great tennis players have to start somewhere, and most typically that is on the junior (mini) court. There are many different levels of junior tennis, for those wanting to play at the top level of competition to take happy just to take out the premiership of their local club. Either way, junior tennis players tend to be filled with ambition and hope for the game. The ambition of junior tennis players often comes with an increased motivation to train and an unwavering eagerness to get on the court each day. This is, of course, a wonderful thing that parents should encourage in their junior tennis players. However, with so much determination and enthusiasm, it does lead to questions such as just how often junior tennis players should train? How much should we pay for tennis lessons? What’s the budget that we have? How far will my kid go in tennis? Much of these question can be answered depending on the age of the child and what level of tennis they are playing. The two factors have a big say in how much they should be pushing their body. Since children’s bodies, bones, and muscles are still developing, there is an easy line to cross in playing too much tennis. Basically, the main things that need to be taken into account for junior players is the fact that their bodies are not fully developed and that they also have other things to focus on in the development. While tennis training should be a priority, it is important for junior players to maintain perspective and energy to stay focused on school and education for a holistic development. Another thing to factor in, depending on age and more relevant to age 11 and under, is that a strong ability in tennis might mean potential in other sports. This means that while tennis can be a focus, junior players should be exposed to other sports. This is also a great way to keep developing other sets of muscles and strengthening the body in a well rounded manner. For 6-8 years olds: 3-4 sessions a week is enough, with each session lasting no longer than 45 minutes. Consider encouraging other sports, such as soccer, basketball, or swimming with a mix of 50% tennis – 50% other sports through the week. For 9-11 years olds: 1 hour, 3-4 times a week keeps the tennis skills maintained. The mix of other sports can be about 70% tennis – 30% now. For 12-14 years olds: 2-3 hours a day, 4-5 times a week of group lessons if their interest is thriving. Keep some balance with other sports, such as 85% tennis – 15% other sport through the week. For 15-16 year old (intermediate level): 3-4 hours of training a day, 4-5 times a week, with tennis being more of a sole focus. For 16-18 year old (advanced level): 3-4 hours a day, 5-6 times a week, again having a singular focus on tennis. Previous Previous post: How Many Private Lessons/Group Lessons Should a Junior Player Have In a Week?